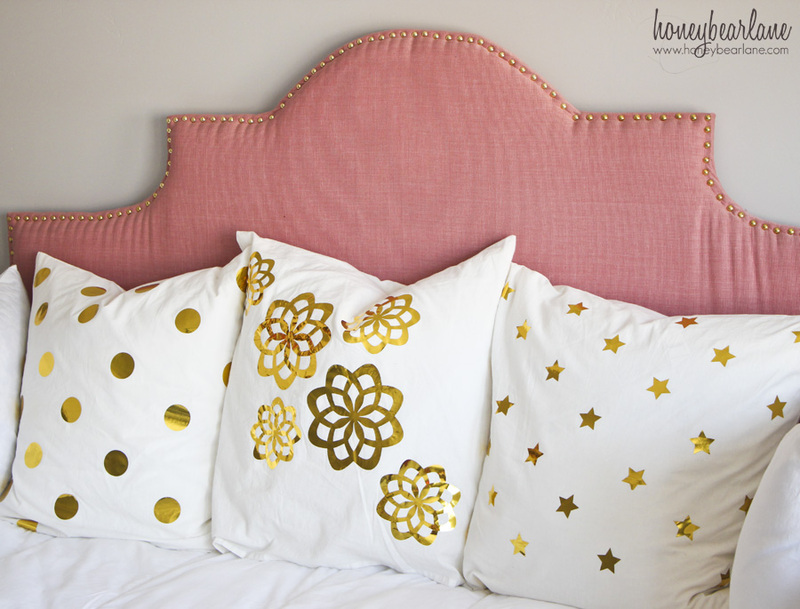 I really wanted some more gold accents in my daughter’s room, so I thought some gold foil pillows would be perfect. And I love how they turned out, especially the little stars. My daughter’s room is going to be a long road. I can’t decide what I want and even though I have visions in my head, it doesn’t always end up going that direction. I can’t just throw out all her existing stuff, I have to find ways to incorporate it. I even started making a triangle quilt but my sewing machine is STILL not in working order (which is seriously making me irked) so that won’t be happening anytime soon. 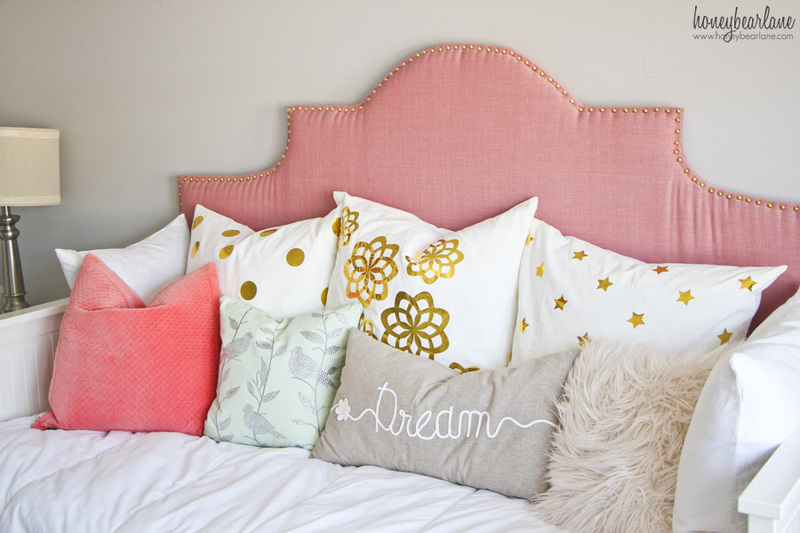 But I do like these gold pillows. Want to make some? These gold foil pillows are easy, but not super quick. So allow yourself some time. 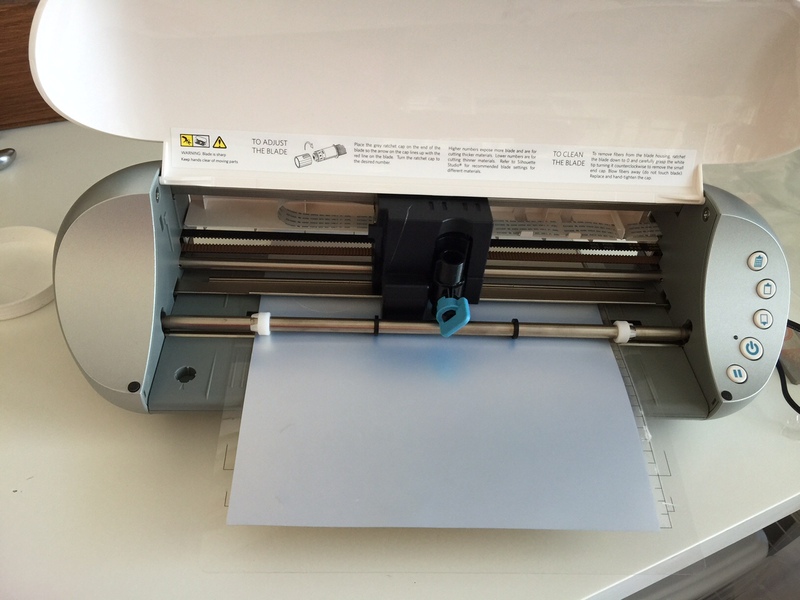 I bought some gold foil vinyl fabric transfer paper from Happy Crafters. I loved it but now I kind of wish I had gotten something a little less shiny. These are very metallic…but I still like them. I used my Silhouette to make a 2.5″ circle, a 1.5″ star, and these giant flowers and cut them on the foil setting. The blade was at a number 7 or 8. I tried it on less and it didn’t work. Make sure you put the gold shiny side down. 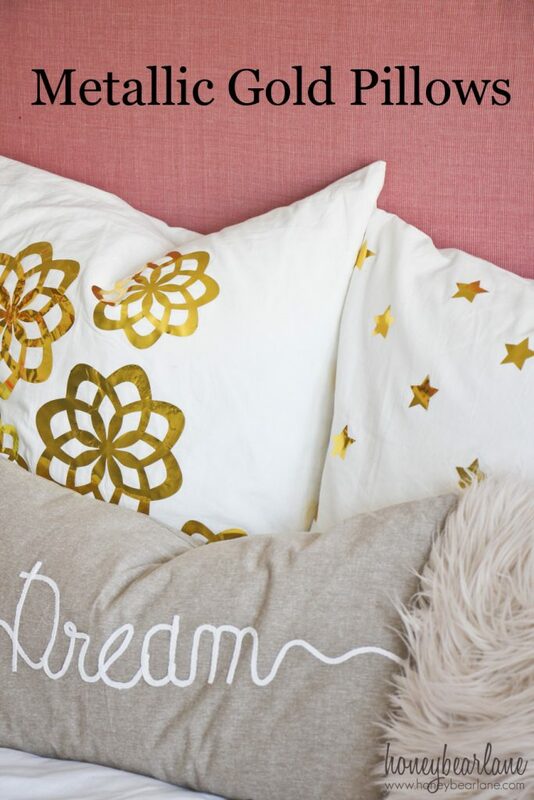 Remove the negative space and cut the circles, stars, or flowers apart. I bought some 26×26 plain white cotton pillowcases from IKEA. These are going to be Euro shams for my daughter’s daybed. 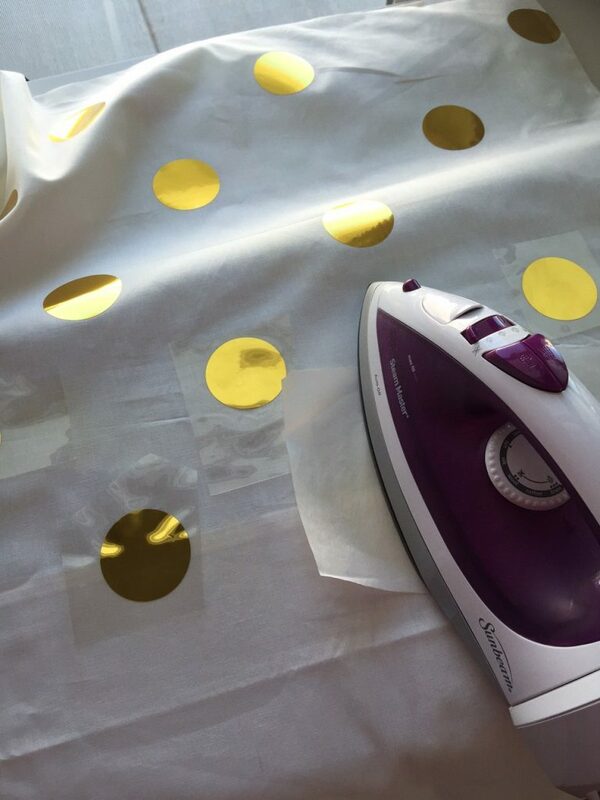 Using parchment paper between the iron and the foil, put the foil circle down on the pillowcase, starting in the corner. Press the iron down for 30 seconds without steam and then let it cool before peeling off the hard clear plastic. Repeat again with each circle, placing them carefully in a bricklay pattern. 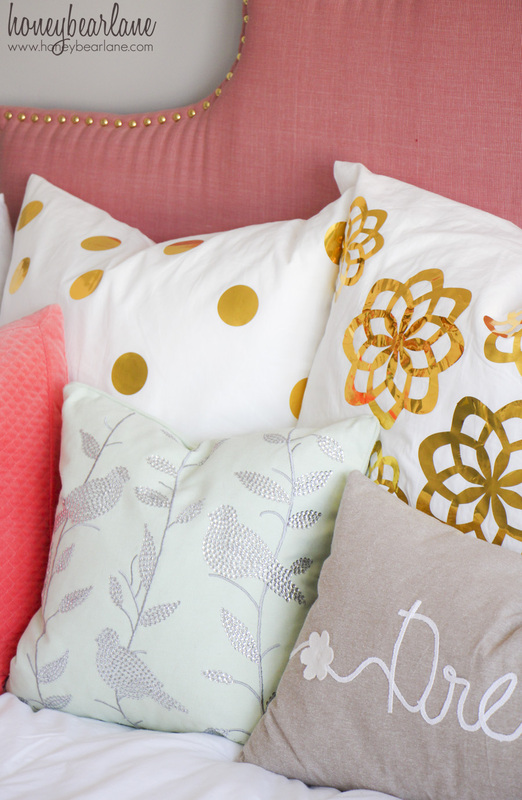 I haven’t washed these yet but since they are just decorative pillows, they won’t get washed much. Since it’s fabric vinyl it should stick well enough. I wouldn’t dry it in a machine though. I can’t wait to see how this room all comes together, it’s going pretty well so far!